A disputed goal eight minutes from time was the difference between the sides in this Rd.1 game at Celbridge. In a game where there was many handling errors and inaccurate shooting by both sides, Naas were the better team in the first half and deserved to be more than a point ahead at the break.Naas led 1 – 7 to 1 – 6. Celbridge dominated the second half scoring five points without reply and that controversial goal sealed it for the home side. Celbridge opened the scoring with points from David Byrne and David Hughes. A Brian Stynes goal after a one –two with Eamonn Callaghan edged Naas kin front agfter ten minutes. Further Naas points by Ailin McDermott and Ronan Joyce put Naas three in front. The home side replied with another two points from Byrne and Hughes and a 21st. minute goal from James Killian to take a two point advantage . Naas drew level with points from Eamonn Callaghan and Darragh Kirwan and went two up with a Ronan Joyce free and another Kirwan point. The teams swapped points before a late Hughes point left one between them at the interval. 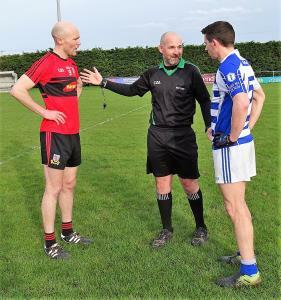 The third quarter belonged to Celbridge as they moved four clear with five unanswered points from Mark O’Sullivan(2),David Byrne(2) and David Hughes. Naas points from Ciaran Doyle and Darragh Kirwan reduced the arrears to two points . That David Hughes goal in the 22nd.minute put Celbridge in the driving seat. Naas tried hard in the remaining minutes but two Eamonn Callaghan points was their only reward. Scorers: Naas: Darragh Kirwan(0 – 4), Brian Stynes(1 – 0), Eamonn Callaghan(0 – 3). Ronan Joyce(o – 2), Ailin McDermott and Ciaran Doyle(0 – 1 each). Celbridge: David Hughes(1 – 5), David Byrne(0 – 4), James Killian(I – 0), Mark O’Sullivan(o – 2). Naas: Luke Mullins, Paul Sullivan, Eoghan Bateman, Fiachra Piggott, Colm Joyce, Conor McCarthy, Ailin McDermott, Philip Cocoman, Sean Cullen, Brian Byrne, Ronan Joyce, Brian Stynes, Dean McHolmes, Darragh Kirwan, Eamonn Callaghan.